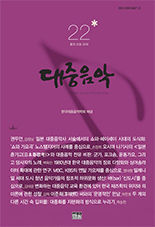 김정원,(2011).“Hey 이젠 날 봐봐 Mister”.대중음악,(8),46-78. 이 글은 2000년대 한국 걸그룹을 둘러싼 여러 쟁점 중 시각화와 성애화를 살펴보고자 한다. 2000년대 중후반을 거치면서 걸그룹들은 한국 대중음악계에서 압도적인 위치를 차지하게 되는데, 이 배경에는 그들의 예쁜 얼굴과 날씬한 몸을 이미지로 내세운 강력한 전략이 있었다. 이 전략은 걸그룹 멤버 개인의 건강 혹은 개성 표현의 차원에서 선택적으로 이루어진다기보다는, 이윤 추구를 위한 기획사의 규제에 따른 것이다. 걸그룹의 몸이 이미지로 재현될 때, 관객 혹은 시청자와 걸그룹 사이에 권력관계가 형성되면서 걸그룹은 시각적 대상화가 된다. 특히 이러한 권력관계는 남성적이고 능동적인 보기와 여성적이고 수동적인 보이기의 메커니즘으로 해석될 수 있다. 이 메커니즘에는 남성의 시각쾌락증, 관음증, 물신주의가 도사리고 있기도 하다. 이러한 메커니즘은 시각 매체에서 걸그룹이 재현되는 방식들에 영항을 주면서, 걸그룹이 시각적 대상에서 성적 대상에 이르도록 작용한다. 특히 여성의 신체 일부만 강조하는 방식은 전형적으로 성적인 대상으로서의 여성을 나타내기 위함인데, 미처 성인이 되지 않는 어린 걸그룹 멤버가 이와 같이 여성의 섹슈얼리티를 암유하는 방식으로 재현되는 동안 소아성애의 문제가 제기될 수도 있다. 2000년대 한국 걸그룹이 시각의 대상에서 성적 대상으로 옮겨 가는 과정에서 간과해선 안 될 부분이 있다면, 그들을 성적 대상으로 향유하는 계층일 것이다. 이 글은 ‘삼촌팬’이라 불리는 20대 중후반 이후의 남성 팬덤에 주목한다. ‘삼촌팬’은 걸그룹의 음악을 소비하면서 무의식적으로 자신들의 성적 욕망과 환상을 걸그룹에게 투영하고, 나아가 걸그룹을 재현하는 시각 매체에 내재되어 있는 남성 관음증과 자신의 시선을 동일시함으로써, 결국 걸그룹을 성적 대상으로 간주하기에 이른다. This paper examines the visualization and sexualization of K-pop girl groups in the 2000s. K-pop girl groups have occupied an overwhelming position in the K-pop scene. In this scene;entertainment management agencies have been using the popular images of K-pop girl groups’ cute faces and slim bodies as a powerful strategy to increase profit whether the girls themselves want this or not. Promoting the body image of the girls objectifies them;creating an unequal power relationship between the girls and viewers (audiences). In particular;this power relationship involves males;who are actively looking and female;who are passively being looked at. This relationship stimulates the development of men’s scopophilia;voyeurism;and fetishism. Therefore;not only are the girls visually objectified but they are also sexually objectified. Particularly;the way in which visual media emphasizes the parts of the female body interprets women as sexual objects. When young girls under 20 years old are represented in a way that female sexuality is metaphorically implied;pedophilia becomes an issue. This paper looks at ‘Uncle Fan,’ a middle-age male fan;as a construct embedded in visual media who projects his sexual desire and fantasies into the girl group as the audience watcher. This view ultimately results in the sexual objectification of the girl group.